In the automotive world the Polaris General-4 1000 EPS would be called a Crossover vehicle. Creating the General two and four-seat machines meant a blending of two famous Polaris lines. 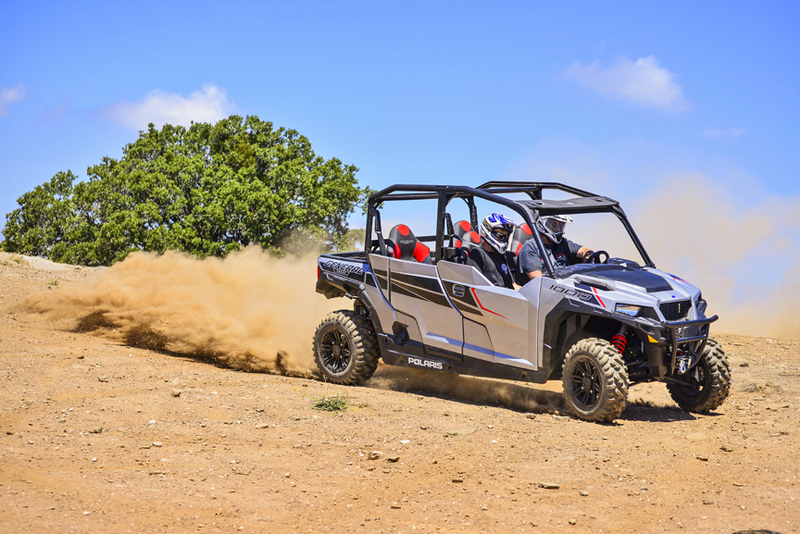 What they really did is take the best from their long-standing RANGER utility models and mix it with a good amount of RZR performance, creating a new model with an appeal to riders from both worlds. On their own website they call the General-4 “The most powerful recreation and utility vehicle ever built, with room for 4”, which says a lot about what it is designed to do. Think of the General-4 as a sports wagon with a Hemi under the hood. What you get is handling, speed, and function. The General 4 is easy to drift. Stay on the throttle and you’ll be slinging it predictably sideways every chance you get. 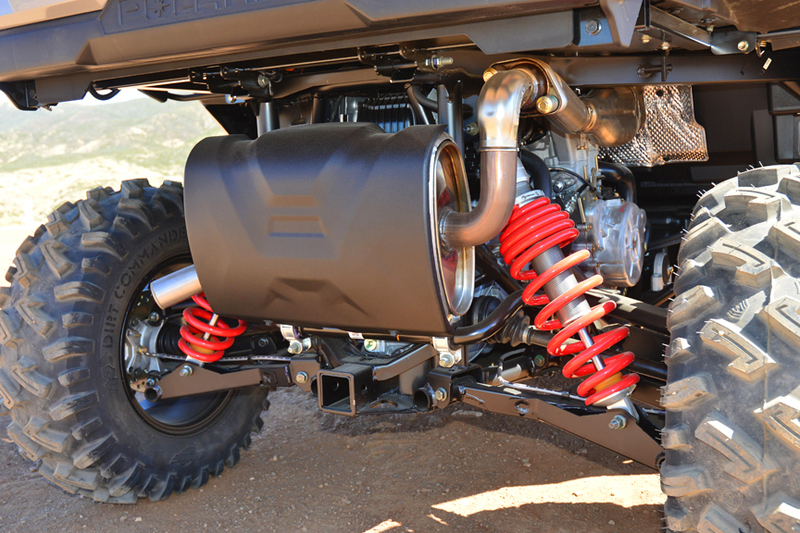 The underpinnings of the General and General--4 are very similar to the RZR-S model undercarriage. 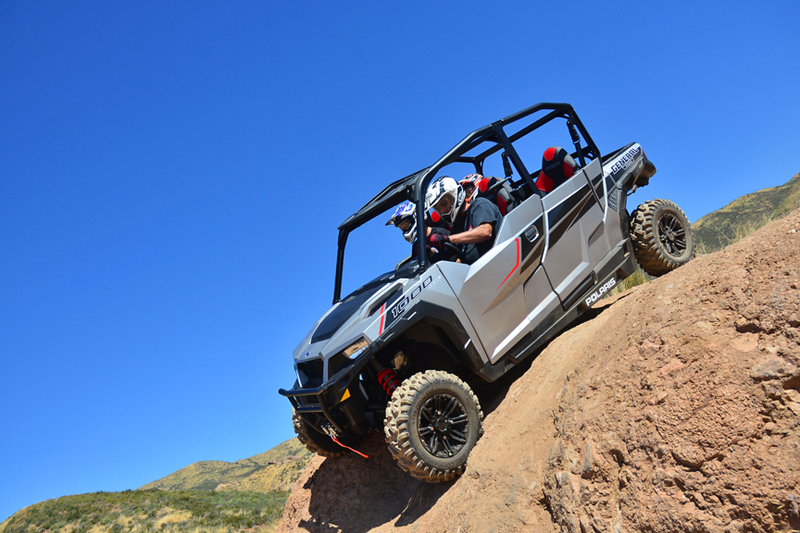 The RZR-S line and General have moderate travel, handling, and power, which is perfect for a sport utility vehicle. Even though they share a nearly identical engine, the General has slightly different tuning compared with the RZR-S. This is done with a different EFI map and a slightly different CVT clutch set up geared more toward weight and towing capacity. It moderates throttle response slightly for when you want to tow a trailer or are drafted into landscaping duties around the yard. 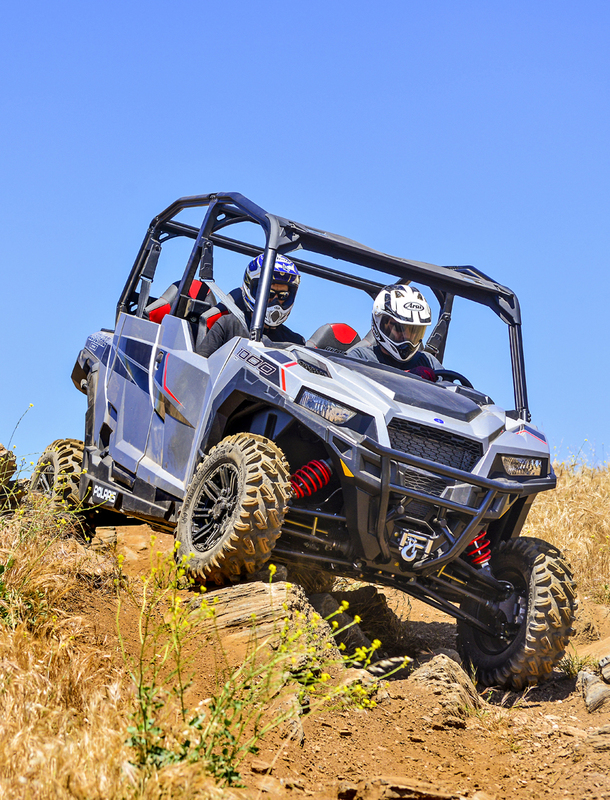 It just takes slightly more initial throttle input to get the General rolling than a RZR-S or XP model, and that’s a really great feature in rocky terrain. The General also has a different intake tract with tubing routed higher in the chassis, allowing it to plow through deeper water than the RZR-S. 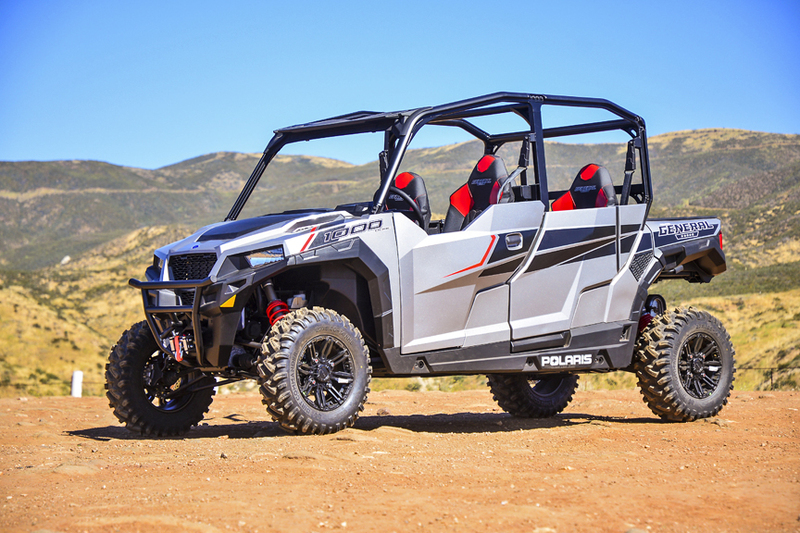 The slight differences make it a touch slower than the RZR-S, but the General will climb hills and do pretty much do anything the RZR-S will do, albeit at a slightly slower pace. 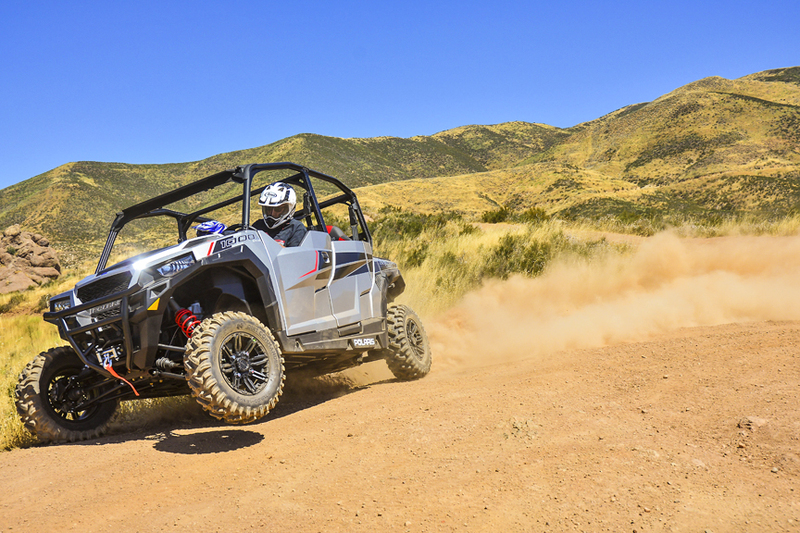 Unlike its big brother Ranger, the General-4 works really well at a fast trail pace thanks to its RZR based chassis. You can drive it with the throttle, drifting corners and just sailing it down the trail like the performance vehicle it is. The double A-Arm suspension gives you a plush ride on the trails. With 12.25" of front wheel travel and 13.2" of rear travel it has plenty of suspension to soak up the bumps. A-Arm rear suspension does not offer the long travel the trailing arm equipped XP models have, but A-Arms give you a plusher ride, and that's perfect for this type of vehicle. It does everything well except pound whoops, and who wants to pound whoops anyway? Go around them or find a better trail! The General-4 has a slight push if running hot into corners, but the front differential will pull you around the corner when you hammer the throttle, and you can finish the corners with a very predictable drift. This is the real upside to the General. When it's driven in sport fashion it does things a Ranger could never do. Drive the Ranger with the wheel. Drive a General with the throttle. It also likes being driven at high speeds! When driving it on an aggressive ride through the Sierra Nevada mountains we ripped down some trails at well over 60 MPH, and even into the low 70's for a blast down flat, graded sections. That’s hauling the mail in a crossover machine! Nobody really paid much attention to brakes until sport and performance Side x Sides came along. On an ATV you could just shift your body and pitch it into the corner. Try that on a Side x Side! Thankfully the Generals brakes are capable of handling all the power the engine can dish out. The brakes on the General are actually a step back as compared with the RZR line, with 2 piston front calipers and single piston rear calipers. Still, in stopping power it has everything you need. It controls and stops well, and pedal pressure is perfect. We didn't even know it had less brake caliper (compared with the RZR) until we read the spec sheet. When we needed them they felt the same! The General-4 seats are actually more comfortable than the RZR seats, with a slightly higher seating position. The driver's seat is also adjustable. Legroom for the driver is a bit more cramped than on an RZR, and a 6’-4”driver notices that right away. 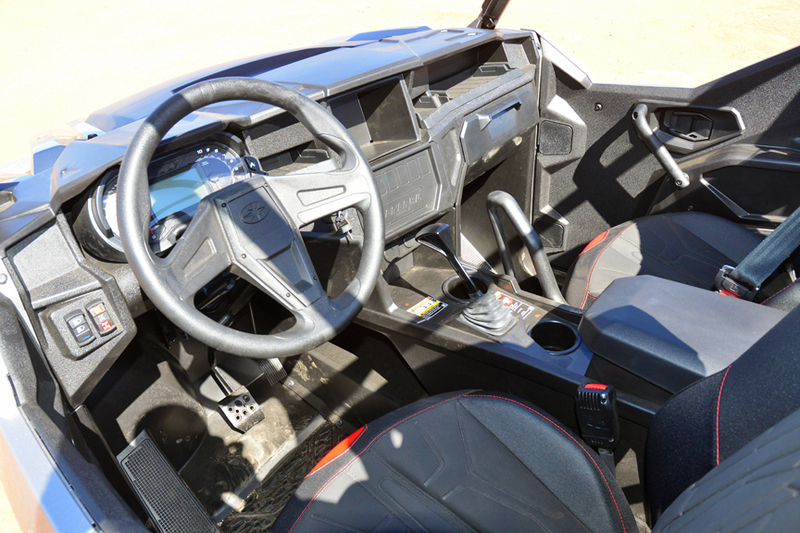 We plan to steal a little more leg room for the driver like we did on our RZR 4 by re-positioning the driver's seat. We'll keep you posted on that update. The rear seats actually provide more legroom than the front, and that means adults in the back seat comfortably. A center console in both the front and rear provide a place to rest your arm, but also additional storage and a charging station. The front doors have armrests built into them but they are placed poorly. You really can't rest your arm on them as they are too low, and you'll occasionally whack your elbow on it when whipping through a turn. The dash has another handy charging station and some storage is built in, with a rubber mat to help dampen vibration and provide a little grip to whatever you put in it. It works better on the farm. When using the car for recreation or fast trail rides anything set in the dash along with the rubber pad is going to be on the floor. There are also two large cup holders front and rear. The co-driver has nice handholds that are better and more comfortable than the RZR T-bar. We really like how the gauges tilt with the steering wheel, and the driver can program the instrumentation to show different functions of the machine, with different colors on the display screen as well. There is room in the center of the dash for a good sized navigation system, which Polaris Accessories has available, or you can opt to buy the General-4 equipped with the Ride Command navigation system. The cargo capacity of the General and General-4 is outstanding, and it’s a big part of what makes the General such an attractive vehicle for so many. It has a large bed with a tailgate, allowing you to pack enough for an off-the-grid weekend camping trip, and a very nice dump bed to quickly unload the camping junk so you can get back to the trail and have some fun. The weight and dump capacity for the bed is rated at a hefty 600lbs. If you need more than 600 lbs. of camping gear for a weekend trip you would be better off staying in town at a hotel! It will be no problem getting anything you would hunt in North America back to camp, either on a trailer pulled behind thanks to the 2" receiver hitch, or strapped into the bed. Mounted up front is a heavy-duty bumper and 4500-pound winch for getting you out of sticky situations and it is controlled by a switch on the dash. The basic model General-4 1000 EPS comes with Walker Evans shocks. They’re adequate for most situations but are only pre-load adjustable. If hauling 4 adults at a sporty pace you’ll want to increase the preload a couple turns to compensate for the added weight and lost ground clearance. Adding pre-load in this manner lets the shocks start farther up in the suspension stroke, allowing the shocks to continue to work well. If your typical riding covers rough terrain at high speeds an upgrade to a quality aftermarket shock can further improve the ride and offer additional adjustability. The General-4 1000 EPS is the ultimate adventure off-road vehicle. It easily hauls the stuff you'll need for a weekend outing – including extra people – and it has the performance to get you where you want to go at a fun pace. If you have friends with other brands of sport UTV's you will have no problem keeping up on the trail, even with a car full of your cronies! At over 100 miles per tank even when driving aggressively it gets good fuel mileage, and it delivers a lot of fun and value. The Generals ability to easily cross from work to recreation mode makes it a great all-around machine, and even your accountant will get behind it and green light the purchase. Of course it's a work vehicle going to be used strictly for business! Just get ready for him to borrow it.